Regardless of what type of vehicle you are looking to purchase, the devil is in the details. So often it is the attention to details and subtle design features that make one vehicle more desirable than another. 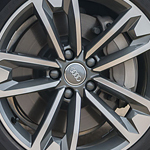 The new Audi A4 allroad is a luxury wagon that hopes to catch the eye of drivers with the right touches. The Audi A4 allroad has a lot going for it that would make it a great vehicle to showcase around town. It comes with a set of LED rear taillights that also include dynamic turn signals. This aesthetic feature helps to leave an impression on all who witness you passing by. Inside the new A4 allroad is an available 8.3-inch center MMI infotainment display. This display is mounted at a height that is both easily visible and accessible. This makes getting the information that you want when you want it a breeze.